This week's spotlight stallion is Gun Runner, a 5-year-old son of Candy Ride that is standing his first season in 2018 at Three Chimneys Farm. Gun Runner made his racing debut at age two, breaking his maiden in his first start that September. He followed that up with an allowance win at Keeneland. He closed out his juvenile season with a close, fourth-place finish in the G2 Kentucky Jockey Club at Churchill Downs. Gun Runner began to blossom as a three-year-old, and would develop into one of the most consistent colts in the country. He began his year with back-to-back graded stakes wins – first taking the G2 Risen Star Stakes and then capturing the G2 Louisiana Derby. After a third-place finish in the G1 Kentucky Derby, Gun Runner came back to win the G3 Matt Winn Stakes. Later in the summer of his three-year-old season, Gun Runner finished third in the G1 Travers, second in the G2 Pennsylvania Derby and second in the G1 Breeders' Cup Dirt Mile. He closed out his year with a victory over older horses in the G1 Clark Handicap at Churchill Downs. Gun Runner was even better in 2017 as a four-year-old, winning five of six starts – his only loss was a second-place finish to Arrogate in the G1 Dubai World Cup. During his championship season of 2017, Gun Runner captured such races as the G1 Stephen Foster, G1 Whitney and G1 Woodward, before capping off his year with a win in the G1 Breeders' Cup Classic. Gun Runner came back for one more race as a five-year-old in 2018 – the $16 million, G1 Pegasus World Cup. The son of Candy Ride didn't disappoint, taking the race by 2 1/2 lengths. He was retired to stud with a record of 12 wins, three seconds and two third-place finishes in 19 starts, with earnings of $15,988,500. Gun Runner from EquiSport Photos on Vimeo. 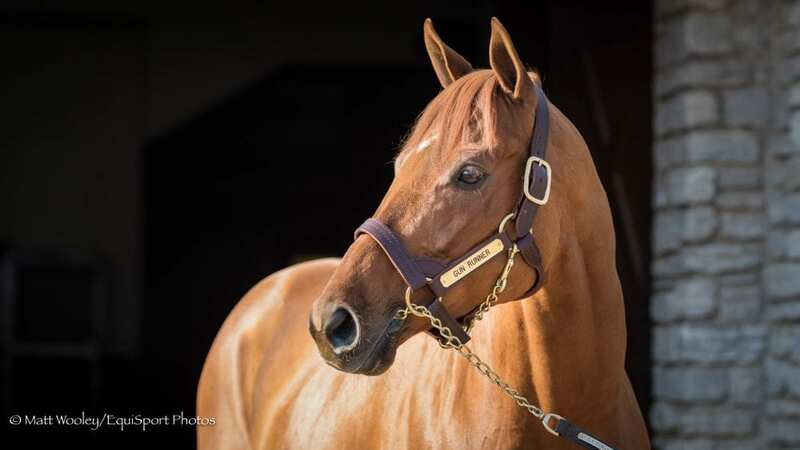 This entry was posted in In The Stud, Videos and tagged gun runner, Horse Racing, in the stud, kentucky equine research, KER, thoroughbred, three chimneys farm, winchell thoroughbreds by Paulick Report Staff. Bookmark the permalink.